Due to the many configurations of the real B-24, the model features modular design to allow each modeler to customize his/her model further. 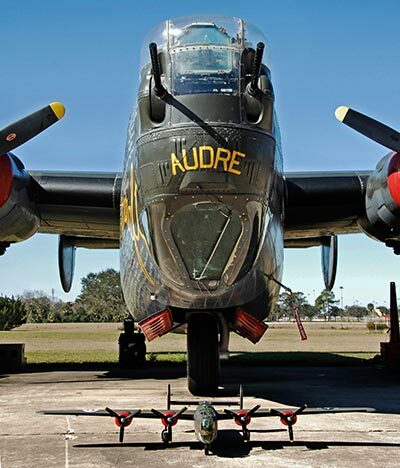 A magnetic nose section allows owners to quickly swap between B-24 variants, the -D (“Greenhouse” nose), and the -J (“Emerson turret” nose), and the Upper Turret on both variants and the Nose Turret on the -J variant can be panned with an optional 9g servo. Steerable tillers are pre-installed, including special provisions to fit FPV cameras in the nose with minimal modification. An internal wooden spine reinforces the bomb bay area, if a modeler chooses to install operating doors. An all new pilot figure sculpt depicts period accurate A-2 crew jacket, radio headset, and iconic “crusher” cap and insignia. Also for the first time at Motion RC, an optional 3D-Printed Cockpit with complete instrument panel, controls, and seats is also available as a separately purchasable upgrade.